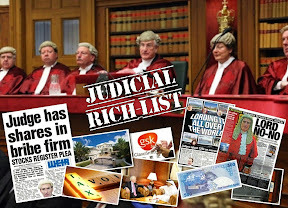 Cameras & tweets in Scotland’s courts – under judicial terms only. 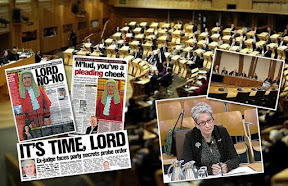 CAMERAS and tweets could be allowed in Scotland’s courts, according to the findings of a review< strong> carried out by Court of Session judge Lady Dorrian on recording and broadcasting of proceedings in court, and use of live text-based communications. 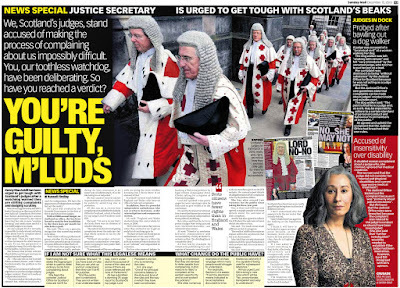 However, Gill – who previously threatened judicial censorship of journalists access to documents and court hearings in a fit of pique against the media last year - said journalists will only be granted use of digital media in courts if they register with the Scottish Court Service. 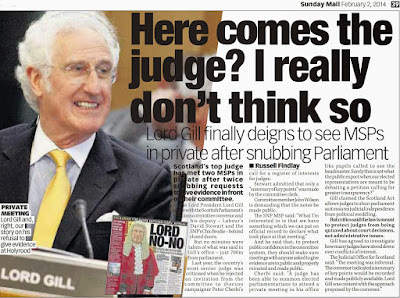 In a speech to a conference on Digital Justice this week, Lord Gill – who is currently fighting a two year battle with the Scottish Parliament against proposals to create a register of judges interests, wealth and links to big business - made it clear any member of the press who was going to tweet or make use of digital equipment must do so on the court’s terms only. Gill also said anyone not registered with the courts could not tweet unless the judge hearing the case gave permission to do so. 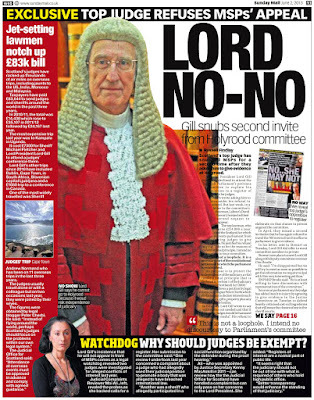 And, in a separate submission to the consultation, an unidentified Court of Session judge who backs the proposals to introduce cameras said there would have to be tight controls on how cases were filmed. 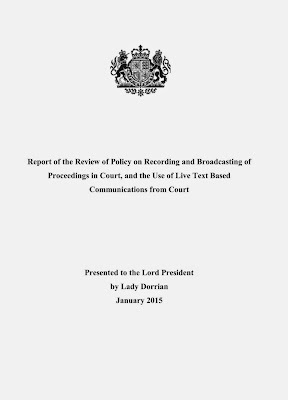 *Filming of civil and criminal appeals, and legal debates in civil first instance proceedings, such as judicial review or procedure roll hearings, should be allowed for live transmission. 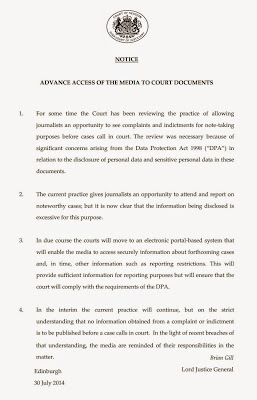 Subsequent news broadcasting and documentary film-making should be allowed subject to clear and comprehensive guidelines. 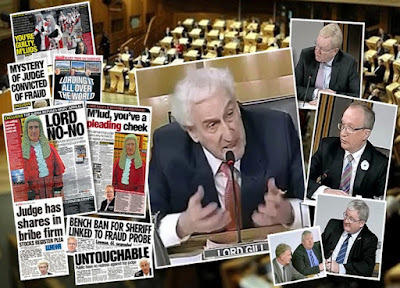 *The court should allow criminal trials to be filmed for documentary purposes in certain circumstances, subject to the safeguards referred to in the report. Cases involving children, sexual offences and vulnerable witnesses should not be filmed. 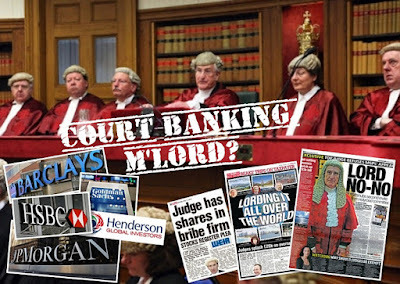 *No live transmission or filming for subsequent news broadcast should be allowed for criminal first instance business or for civil proceedings involving witnesses. 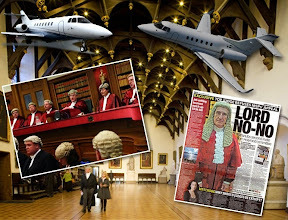 *For subsequent news broadcasts, the delivery of sentencing remarks of the judge should be permissible, with filming focused only on the sentencing judge. 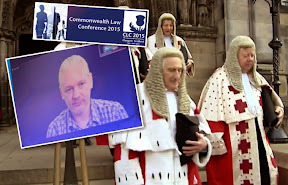 * Filming of criminal trials for live transmission should not be allowed. *In civil cases at first instance, filming for documentary purposes only should be allowed, but should exclude certain groups such as family cases and those involving asylum seekers. *A structured approach to considering applications to film. *All filming should be subject to robust, clear and comprehensive guidelines. 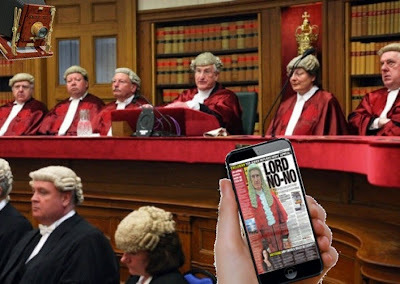 *Journalists who register in advance with the Scottish Court Service should be permitted the use of live text-based communications such as Twitter from court, subject to guidelines which will be issued in due course. 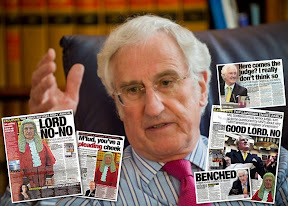 The consultation and review – chaired by Lady Dorrian, comprised almost exclusively a judicial membership of Lord Bracadale, Lord Woolman, Sheriff Principal Stephen, and Sheriff Drummond. 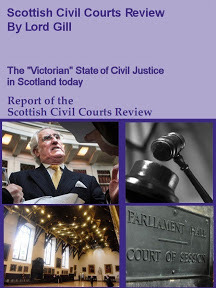 The group was supported by: Christopher Nicholson, Deputy Legal Secretary to the Lord President; Elizabeth Cutting, Head of Judicial Communications; Steven D’Arcy, Head of Strategy and Governance, Judicial Office for Scotland. 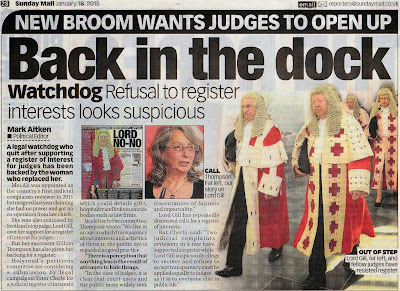 While the move to bring more transparency to Scotland’s courts is a welcome one, no substantive explanation has been given for hold ups in televising courts or why it has taken over two decades to address earlier statements in 1992 by former top judge Lord Hope on the introduction of cameras and other technology to Scotland’s antiquated courts – branded “Victorian” and ‘unfit for purpose’ by Gill himself in the Civil Courts Review. 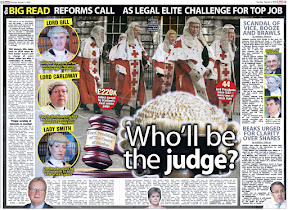 During 1992, Lord Hope, the then Lord President, in effect opened Scotland's courtroom doors to the cameras when he announced, through the Principal Clerk of the Justiciary in Edinburgh's supreme courts, that modern technology had now advanced to a state 'where proceedings in court could be televised without undue interference in the conduct of proceedings'. 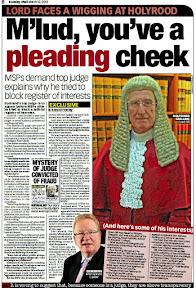 Twenty Three years later in 2015, the glacial pace of change in Scotland’s courts once again promises occasional cameras & tweets, but only when judges deign it in their interests or perhaps, the interests of justice - to allow. 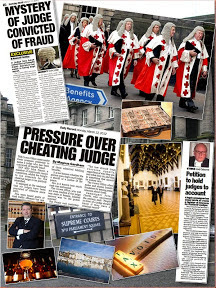 And, despite receiving over £80million pounds a year from public coffers to run the Scottish Courts Service, and multi million pound blank cheques to fund items such as the recent £60 million refurbishment of Parliament House in Edinburgh – Lord Gill’s seat of power, it is a fact public records on what goes on in the civil courts are hard to come by, with findings routinely anonymised where vested interests including lawyers are concerned of being identified in dodgy cases where judges secretly linked to litigants, law firms & big business, are not serving the interests of justice. 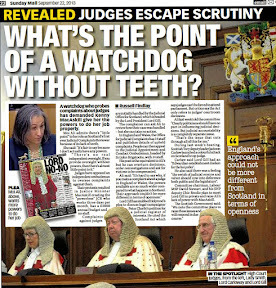 During the summer of 2014, in a bizarre fall out with the press, Scotland’s top judge Lord Brian Gill issued an edict threatening to ban journalists and the press from accessing court papers and hearings. New Judicial Investigator Gillian Thompson follows Moi Ali in support for judges register. 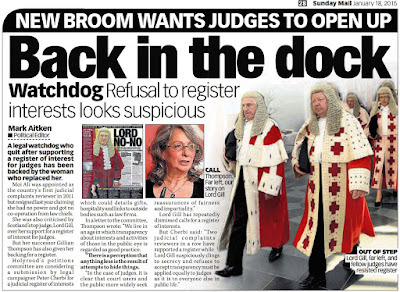 SCOTLAND’S new Judicial Complaints Reviewer (JCR) Gillian Thompson OBE has told a Scottish Parliament Committee she supports proposals currently before MSPs to create a register of interests for Scotland’s judges. 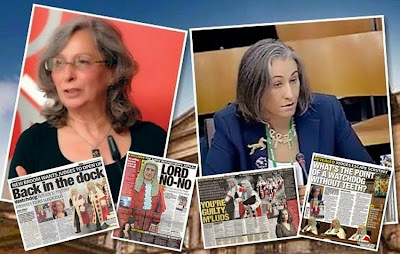 In responses to MSPs questions, Moi Ali revealed she had no statutory powers over judicial complaints, and received no cooperation from Scotland’s top judges. 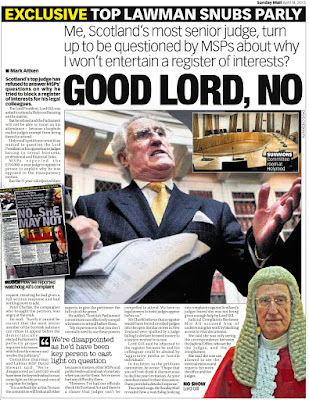 Ms Thompson has also disclosed her own interests to MSPs, following on from the example set by Moi Ali - who created her own register of interests while in the office of JCR. 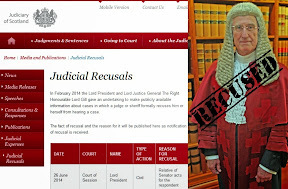 Submission from JCR Gillian Thompson to Public Petitions Committee: I have seen the evidence provided to the Committee by my predecessor Moi Ali in May 2013, what was said by the Lord President in his written submission of 21 November 2014 and previously, the evidence provided by the Minister for Community Safety and Legal Affairs on 9 December 2014. 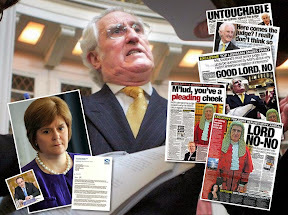 As a general principle I am in favour of those in public life, whether paid or unpaid, being required to maintain a register of interests including hospitality given or received. 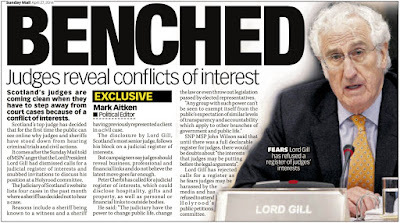 We live in an age in which transparency about interests and activities of those in the public eye is regarded as good practice. There is a perception that anything less is the result of attempts to hide things. 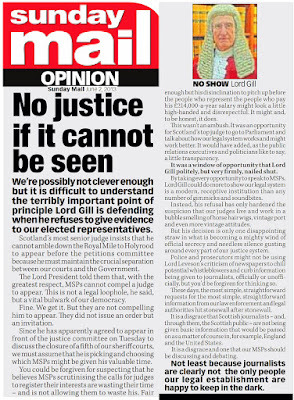 In the case of Judges, it is clear that court users and the public more widely seek reassurances of fairness and impartiality. 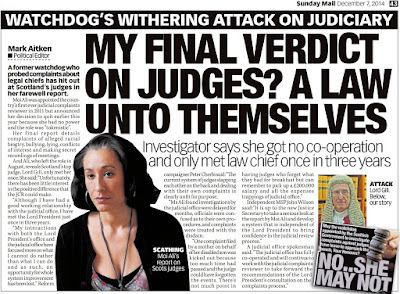 I think it is difficult for those outside the Judiciary to understand the notion that the Oath taken by Judges on appointment should be regarded as sufficient evidence of their commitment to uphold the principles of public life. 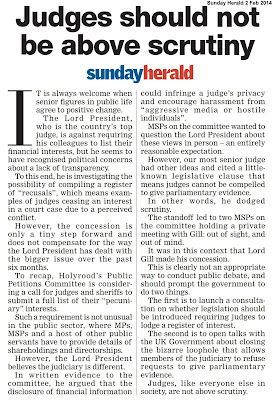 Of course a register as called for by this petition would require to be kept up to date and the burden of cost and responsibility would have to be borne by, most likely, the public purse. 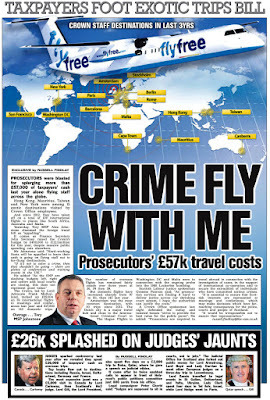 It seems to me however that the costs attached would be offset to a degree by an increase in confidence and, conceivably, a drop in complaints. 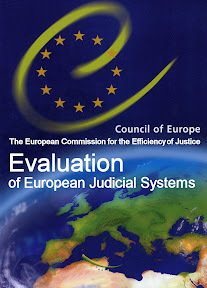 In respect of the Annual Report by the Judicial Complaints Reviewer (JCR) for the period 1 September 2013 to 31 August 2014, the Report is now on the JCR website. 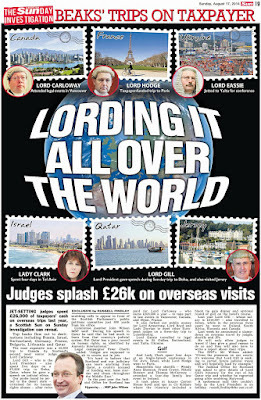 It was sent in draft to the Lord President prior to publication. Finally, I have undertaken to publish my own register of interests on my website. 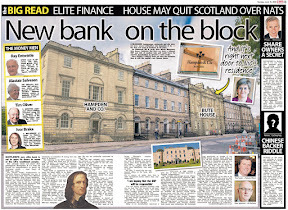 Currently in addition to my appointment as JCR for which I am paid a daily fee of £213 over a restricted number of days annually, I am a non- executive director of Registry Trust Ltd a not- for-profit company based in London (fee of £8,200 paid for 10 days work a year), I am a Scottish Trustee of Stepchange Debt Charity (unpaid), a Scottish Ambassador for Tomorrow’s People a charity that works with disadvantage young people to find employment (unpaid). For each body I am required to provide regular updates of my interests. I am a member of the English Speaking Union Scotland and the Scottish Dachshund club. I make a monthly payments in support of Cancer Research, the RSPB and the SSPCA. 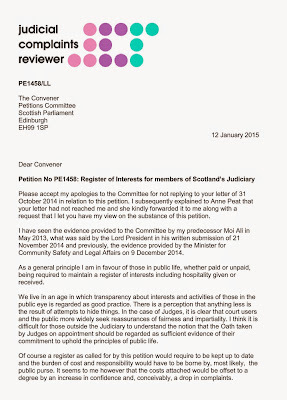 I hope this is helpful in the Committee’s on going consideration of petition PE1458. 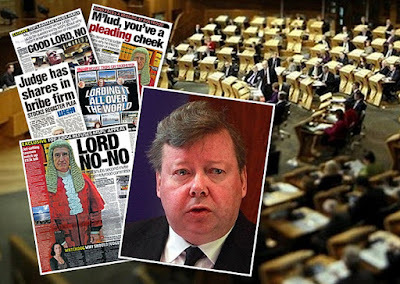 While Scotland’s top judge continues to oppose the creation of a register of interests, MSPs held a debate in the Scottish Parliament’s main chamber on Thursday 7 October 2014. The debate resulted in cross party support for the proposal. 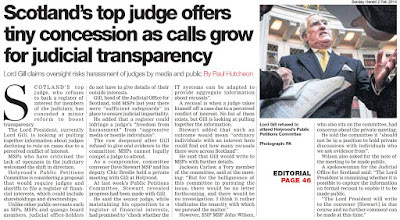 MSPs overwhelmingly supported motion S4M-11078 - in the name of Public Petitions Convener David Stewart MSP on petition PE1458, urging the Scottish Government to give further consideration to a register of interests for judges. 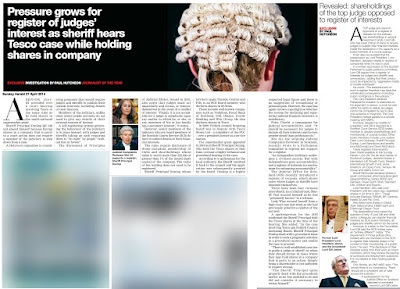 Regulator admits sparse use of powers on legal fees. 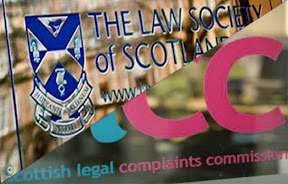 DOCUMENTS released under the Freedom of Information Act reveal the ‘independent’ regulator of legal services in Scotland - the Scottish Legal Complaints Commission (SLCC) is failing to use its powers to reduce legal fees to zero when presented with detailed complaints & evidence about rogue lawyers – even after the regulator eventually decides the lawyer is guilty of failing their client. 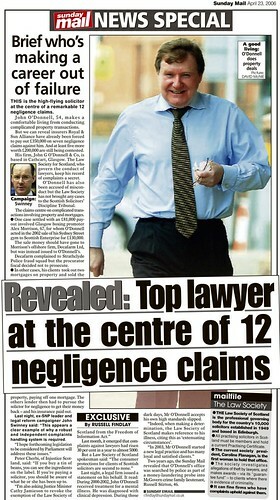 Among a raft of data on how compensation is paid by the legal profession to clients after complaints have been investigated, upheld, or mediated, the regulator was forced to admit it had used powers to nullify fees in only two cases in the past year which resulted in clients not having to pay their lawyer a penny. 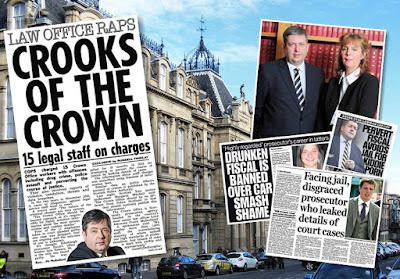 In one case, the SLCC said fees were recorded as being reduced to nil at the “determination stage” – where the SLCC usually conclude a solicitor is guilty of a variety of offences including having providing poor legal services to clients. 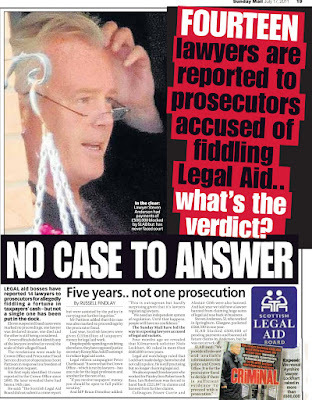 And, in stark contrast to the SLCC’s claims of overall success in mediation, the regulator also revealed the only other case were fees were reduced to zero was a mediation case - raising questions about why lawyers are able to recover any fees at all after being found guilty of ruining a client’s legal affairs. 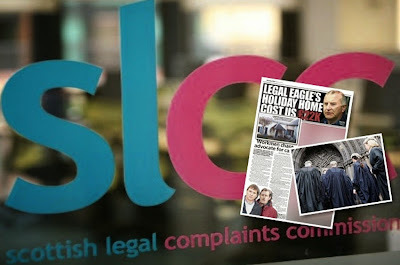 When asked to give a total amount of exactly how much compensation had been paid at the time of the release of the SLCC 2014 Annual Report – which made a big show of £365K being paid to clients in compensation & fee abatement deals, the SLCC claimed it had no records and therefore could not answer. The regulator said law firms who agreed to rebate fees or pay compensation did not tell the SLCC when such repayments were made, if at all. 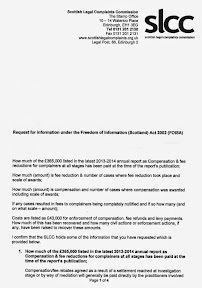 The information released by the regulator which details compensation and fee reductions paid in the last year, 2013-2014, reveals the highest award made by the regulator against a rogue solicitor or law firm - was £20,000 - while the lowest award was a mere £50. 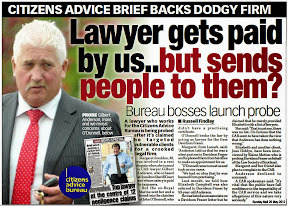 While awards of compensation to clients and fee rebates are up, the fact that other than in only two cases, all solicitors & law firms who were found to have provided clients with poor legal services were still able to recover some amount of fees from their clients raises the prospect that clients who complain about their solicitors are not making the point clear enough to the SLCC they expect fees reduced to nil. 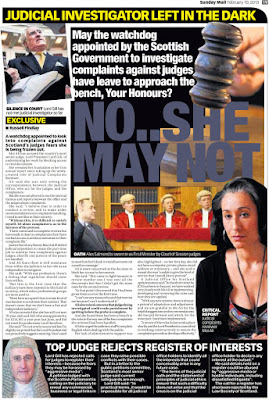 In one case currently being looked into by journalists, it appears a client who made a complaint about their solicitor and asked for fees to be reduced to nil was talked out of it by the SLCC itself. Compensation/fee rebates agreed as a result of a settlement reached at investigation stage or by way of mediation will generally be paid directly by the practitioners involved to the complainers. 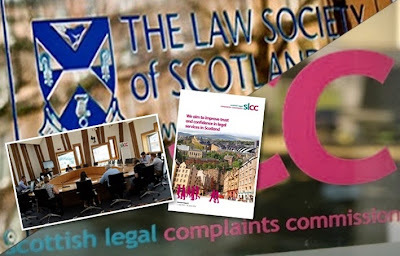 Although the SLCC will check that agreements are adhered to, it does not hold records of how much of the compensation/fee refunds has been repaid to complainers in these cases and it is not copied into correspondence between practitioners and complainers about payment arrangements. The total amount for fee reduction is broken down between cases resolved at investigation stage, cases resolved by way of mediation and cases which have gone to determination. Figures are produced for each of these stages. The figures are recorded for the last financial year July 2013 - June 2014. At investigation stage fee reductions were made in 15 cases. £9360.35 was agreed in respect of fee refunds. The lowest amount of fee reduction agreed was £91 and the highest was £2112. At determination fees were abated in 30 cases. The SLCC does not have complete records of the total fee rebates awarded in those cases as it is often not provided with details of the final figure for the fee rebate from the practitioners once a determination is made. I can, however, advise that from our records the total fee rebates awarded at determination amounted to more than £29,608.99. The lowest figure for fee rebates at determination I have identified is £50.50 and the highest is £14,876.32. At mediation fee reductions were made in 12 cases. A total of £29,610.40 was agreed in respect of fee reductions. The lowest amount of fee reduction I have identified was £488 and the highest was £13,417.74. The total figure for compensation is broken down between cases resolved at investigation stage, cases resolved by way of mediation and cases which have gone to determination. Figures are produced for each of these stages. The figures are recorded for the last financial year July 2013 - June 2014. At investigation 44 cases were resolved and the sum of £50,627.56 was paid in compensation for injury and distress in respect of those cases. 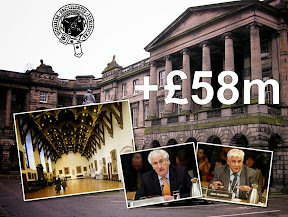 The lowest amount of compensation agreed was £50 and the highest was £6752.66. In 4 cases compensation was paid for losses. The total paid for losses amounts to £22493.50, with the lowest amount being £1000 and the highest £17,000. At determination compensation was awarded in 86 cases amounting to £191,515.56. This amount covers compensation for injury and distress as well as compensation for losses and outlays. 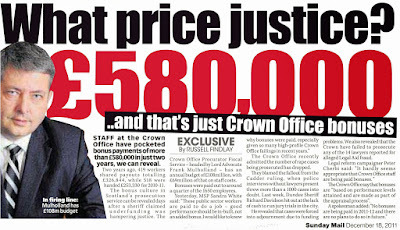 The lowest amount of compensation awarded was £50, the highest was £20,000. 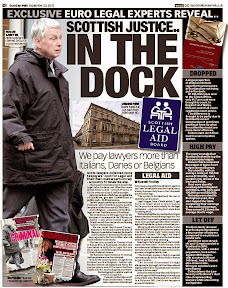 At mediation compensation was agreed in 31 cases amounting to £37,187. This amount covers compensation for injury and distress as well as compensation for losses and outlays. The lowest amount of compensation agreed was £50 and the highest was £8750. At investigation we have no records of any cases where fees were reduced to nil. At determination we have records of fees being reduced to nil in one case. At mediation we have records of fees being reduced to nil in one case. 5. Costs are listed as £43,000 for enforcement of compensation, fee refunds and levy payments. How much of this has been recovered and how many civil actions or enforcement actions, if any, have been raised to recover these amounts. The figure of £43,000 provided in the annual report is an estimate of the staff costs for the work undertaken in recovery of compensation and levy payments etc. The amount does not cover the legal costs of raising actions for recovery of funds. This sum is not recoverable. Regulator's guide for advocates written by advocates.. 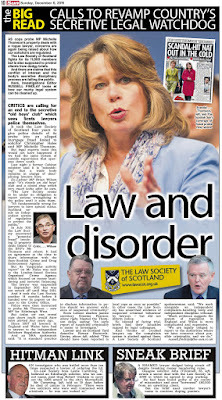 ADVOCATES who face complaints over poor provision of legal services & sub par performances in Scotland’s courts now have a new weapon in dealing with complaints - in the form of a ‘help guide’ on how to deal with dissatisfied clients. 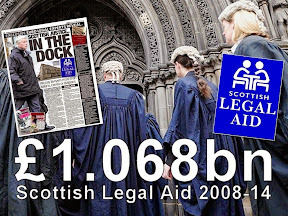 The nine page booklet, issued yesterday by Scotland’s ‘independent’ legal regulator – The Scottish Legal Complaints Commission (SLCC) - was developed with the co-operation and input of the advocates own lobby group - the Faculty of Advocates. 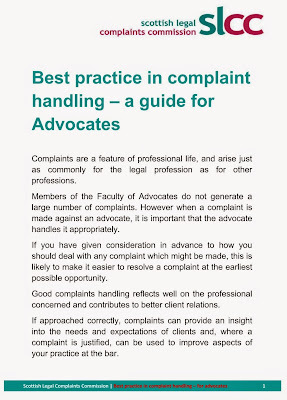 The guide, published below, covers six basic principles of complaints handling and three steps to effective complaint handling. 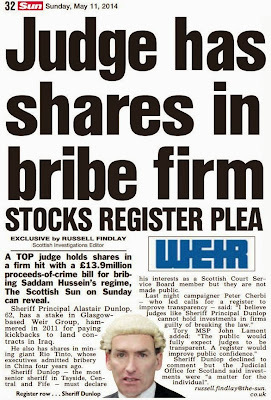 It also includes an example of a model complaint handling process for Scotland’s highly paid, mega earning advocates. 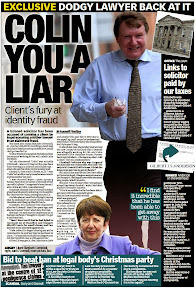 However the guide’s references to transparency & fairness appear far from the reality of how the legal profession deal with complaints against its own in the environment of self regulation – where on occasion, advocates have used law firms to threaten clients who make complaints about their conduct. 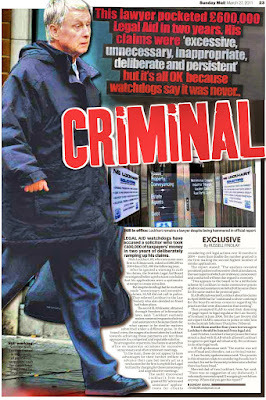 In at least one instance known to the media, an advocate even used Police Officers in an attempt to escape a complaint. The guide states: At the outset, the approach to the complainer should be empathetic and not defensive - a defensive response will usually prove counter-productive. Try to see the complaint from the client's perspective and engage openly, demonstrating an understanding of the issues which the complainer has raised. Bear in mind that it may have been difficult for the complainer to raise the matter by way of a complaint, particularly where they are emotionally involved. It then goes on to claim: To achieve and maintain credibility it is important that the complaints process is transparent and fair. Complaints should be dealt with in a consistent approach which is, at the same time, proportionate to the complaint. The response to the complaint should be based on the facts surrounding the matter complained of rather than on assumptions. Each individual advocate is responsible for handling any complaint against him or her, but communications may be passed through Counsel's Clerk. Guidance can also be obtained from a Faculty Office Bearer or from the Dean's Secretariat. • Be alert to any expression of dissatisfaction which should be regarded as a complaint, or at least a potential complaint, and treat it as such. Remember that this could be received by your Clerk or a member of FSL staff dealing with an outstanding fee. • Engage with the client to understand the issue at hand. Do this through your Clerk if you wish to maintain some distance. • Be empathetic with the complainer, be aware of the impact which the issue may have had on the complainer, including the emotional impact of bringing the matter to your attention. • Don't avoid the problem or hope that it will go away; always respond to a complaint. 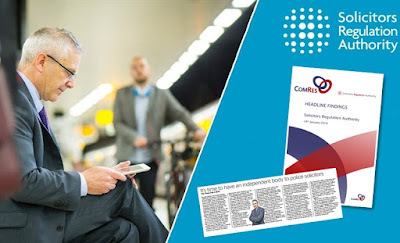 • Don't delay dealing with the complaint - the last thing you want is an additional complaint about concerns not being dealt with in good time. 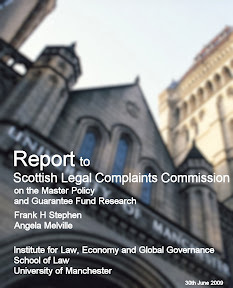 Commenting on the guide, former MSP and now Vice-Dean of Faculty Gordon Jackson QC said: “As the SLCC indicated in its most recent annual report, there are very few complaints about advocates. As a result, it is helpful to have been able to produce a guidance document for those members who may not have had to deal with a complaint," said Gordon Jackson, QC, Vice-Dean of Faculty. "The Faculty is and always has been committed to promoting the provision by its members of the highest quality legal services. It is important that the public should know that if an advocate receives a complaint, it will be handled properly and in accordance with standards approved by the SLCC. 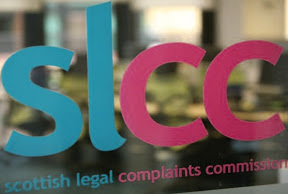 We have therefore been pleased, in the course of revising our complaints and disciplinary procedures, also to have worked very closely with the SLCC to prepare guidance for our members on complaints handling." 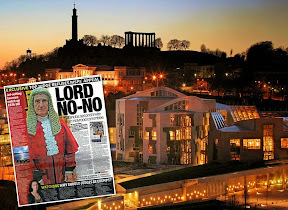 Vice Dean Mr Jackson - who once lost a £50K claim for slipping on ice covered pavements on Johnston Terrace in Edinburgh after temporary judge Gordon Reid QC said he had no relevant case against Edinburgh City Council – also sought to reassure the public over how complaints about advocates are handled. The guide was formally launched at an event on 8 January at the Faculty of Advocates by the SLCC’s Head of Oversight and the Dean of Faculty. 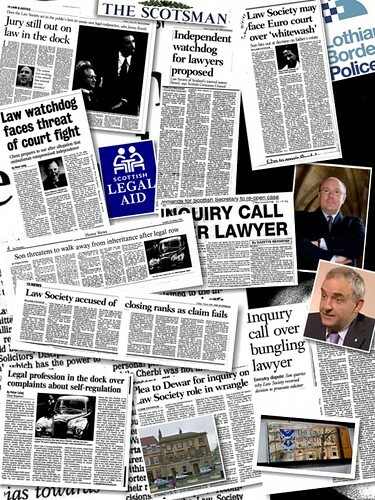 The guide follows a previous guide for solicitors. Both guides are available on the SLCC’s website at Guidance and Advice for Practitioners pages.